This paper proposes a new technique based on inverse Markov chain Monte Carlo algorithm for finding the smallest generalized eigenpair of the large scale matrices. Some numerical examples show that the proposed method is efficient. Monte Carlo and quasi Monte Carlo methods comprise that branch of experimental mathematics which is concerned with experiments on random numbers. In the last decade they have found extensive use in the fields of operational research and nuclear physics, where there are a variety of problems beyond the available resources of theoretical mathematics [1,2]. The problem of calculating the largest or smallest generalized eigenvalue problem is one of the most important problems in science and engineering. This problem arises naturally in many applications. Mathematically it is a generalization of the symmetric eigenvalue problem and it can be reduced to an equivalent symmetric eigenvalue problem. Recently, evaluating the smallest and largest eigenpair of large scale matrices using Monte Carlo and quasi Monte Carlo methods has been studied [3-5]. A generalized eigenvalue problem (1) is said to be symmetric positive definite (S/PD) if A is symmetric and B is positive definite. where f = Mb. Then under condition , the random variable is unbiased estimator, i.e. Now, consider the following choice for the initial density vector and the transition probability matrix leads to an Almost Optimal Monte Carlo (AOMC) algorithm. Theorem 2. Using the above choice and the variance of the unbiased estimator for obtaining the inverse matrix is minimized. Inverse Monte Carlo iterative algorithm can be applied when A is a nonsingular matrix. In this method, we calculate the following functional in each. 2) Starting from initial vector . 5) Output: Smallest eigenvector and the corresponding eigenvector . Table 1. Computing the smallest eigenpair for different matrices using MCMC algorithm. Figure 1. Relative error based on number of Markov chains. In this section, the results listed in Table 1 are relative errors obtained by MCMC. In all of computations we used the MATLAB function eig (A, B) results in contrast to MCMC algorithm results. A new numerical algorithm based on the inverse Markov chain Monte Carlo algorithm to calculate the smallest generalized eigenpair proposed in this paper. 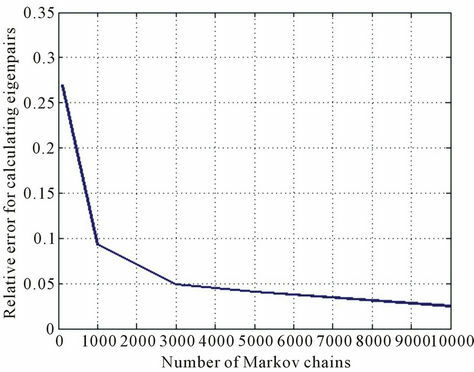 Also, we saw that by increasing the number of Markov chains the relative error is decreased (Figure 1). The author is very grateful to two anonymous referees for giving very useful and valuable comments. Y. Saad, “Numerical Methods for Large Eigenvalue Problems,” Manchester University Press, Manchester, 1991. I. Dimov and A. Karaivanova, “Iterative Monte Carlo Algorithm for Linear Algebra Problem,” Lecture Note in Computer Science, 1996. I. Dimov, “Monte Carlo Methods for Applied Scientists,” World Scientific Pub., Singapore City, 2008. B. Fathi and F. Mehrdoust, “Partitioning Inverse Monte Carlo Iterative Algorithm for Finding the Three Smallest Eigenpairs of Generalized Eigenvalue Problem,” Advances in Numerical Analysis, Vol. 2011, 2011, Article ID: 826376.